Many people struggle to add more organic foods to their diet, and do it in an affordable way. I have been working on this like crazy the last couple of months, ever since checking out Linda Watson‘s book, Wildly Affordable Organic, from the library. It is a wonderful resource, full of simple yet delicious recipes, and a big plan for cooking your meals from scratch, seasonally. The author offers ways to do a little or a lot, but all will help you find ways to save money and add organic food to your diet in a frugal manner. Actually, the techniques and strategies in the book will help you save money on food whether you choose to buy organic or not! Here are some pointers I picked up from reading. This is not a list copied directly from the book, but rather some general ideas that I have found useful. 1. Eat more beans! This is probably the most important strategy in the book. Beans are cheap, nutritious, versatile, protein rich, and filling. And did I mention they are cheap? By preparing my own beans, I have found a way to make the equivalent to a can of organic beans for under a dollar–that’s less than conventional beans on sale! I’m taking the time to cook them mind you, but using the crock pot makes it easy. 2. Cook from scratch. It’s amazing what a loaf of bread costs these days. I mean a high quality loaf of healthy organic whole-grain bread. Baking your own bread is just one example of how making it yourself from scratch can save you a lot of money, and give you a higher quality option. I probably pay less than a third of what a good loaf costs in many stores, for my delicious home made bread. And the same goes for casseroles, pasta sauces, pizza, etc., just to name a few possibilities. 3. Do the bulk of your cooking on the weekend. In the book she offers seasonal meal plans and prep lists for doing the majority of the work on the weekend. I’m not following her plans closely, but this strategy of doing what I can on the weekend has helped to make many things possible, such as making my own yogurt. By planning and taking the time on the weekend, it is easier to do more from scratch. Of course many things can’t be done this way, but giving myself a head start on whatever I can saves me time, and reduces the chance that we’ll have to run out for a pizza during the week. 4. Buy in bulk when you can. In the introduction, Linda talks about shopping on a food stamp budget. She tells of how much more costly things like sugar and flour are in small packages compared to the prices she is used to with getting things in bulk. I find that even buying smaller quantities from a bulk food store can be cost-effective. But not always! Keeping track of prices and trying different stores certainly help me to decide where to buy, but buying in bulk doesn’t always mean storing sacks of food around the house. 5. Go plant-strong. Even if you don’t decide to eat as many beans as Linda Watson proposes, you can certainly reduce your grocery budget by choosing more grains and veggies, and less meat. I can buy a lot more plant food–even organic food–when I choose veggies, grains and beans over meat. We still do eat meat, but I get more value when I use meat as an addition to the meal, not as the main event. I highly recommend this book! I checked it out from the library, but then ended up buying it because it was so useful. While I don’t follow her meal plans or cooking plans to a T, I have still found the book incredibly useful, and am trying more of her strategies each week. All of which is motivating me to save more money while eating more organic food. My favourite peanut butter is the freshly ground kind from the grinder at the health food store. But I recently read that conventional peanuts are usually grown as rotation crops with soy–one of the biggest pesticide loaded crops of all. That got me a bit paranoid about conventional peanuts. The only problem is that bulk organic peanut butter is $12 something per kilo–more than double the price of conventional. Luckily the bulk organic roasted peanuts are only $8 something. While still expensive, it’s cheaper, but now I have to grind it myself. 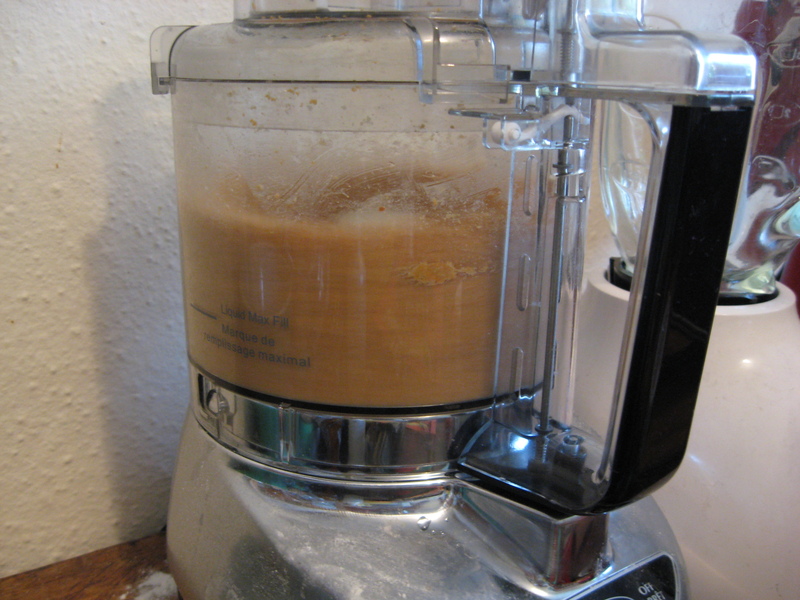 My first attempt at making my own peanut butter, I just chucked the peanuts into my food processor and ground away until I thought it was done. Unfortunately I didn’t process long enough and the texture was gritty and wouldn’t spread on crackers or bread. For my next attempt, after doing some reading on the internet, I tried adding 1 tsp of oil per cup of roasted peanuts. I used some olive oil and some coconut oil (which is a liquid now since it’s heated up here!). I also decided to process it longer. And it worked! At first, the blades were clearly chopping the nuts into tiny pieces, and it sounded like it. Soon, however, it started sounding smoother, and a ball of stuff formed inside the machine. That was the point at which I stopped last time. This time I let it keep going. Soon, I could see a smooth creamy layer forming at the bottom of the food processor. I let it keep going and shortly the whole bowl was full of creamy peanut butter. It’s pretty tasty, and certainly spreadable. While it’s a bit more work, I’m planning on sticking with the organic. And now that the peanut butter has worked, I might try my own almond butter too!